If you've ever lived with a cat, then this book is for you. Cats are not animals that only sleep and eat all day. They want you to play with them, pat them, comb their fur, and cuddle with them on your bed. The one night you want to relax with TV and popcorn, your cat will jump on your lap, lick your face, and wag her tail until the popcorn spills all over the floor. Then she'll settle down, purring loudly, to watch your favorite show. This memoir is a foray into the unique personalities of domestic cats and the behaviors that they have in common, such as stalking, fetching, lying on their backs, hiding in boxes, rubbing against one's legs, playing, and kneading. They are looked on as family members. These felines understand human words and commands and can learn tricks, such as retrieving a ball. Just as human babies have different cries, cats have different meows: "I'm hungry," "I want to go out," "help," and "I want attention." Gwen Cooper's first kitten, Scarlett, was a disappointment. In anticipation for her arrival, she filled the house with cat toys, balls, special food treats, and soft, cuddly cat beds. She had imagined this four-week-old kitten running into her arms, sleeping with her, and playing fetch. However, when Scarlett finally did arrive, she completely ignored Gwen. She didn't play or run after a ball, nor did she sleep on her bed. She behaved as if her owner didn't exist. "Scarlett's eyes seemed to glaze over—was I imagining it?—into a look of indifference. She looked at me, and then she looked through me, and then she kitten-waddled around me as if I were no more then an inconveniently placed traffic cone." Scarlett didn't like humans. But her meows turned into screams when she was hungry or wanted her litter box cleaned. She slowly learned to trust the caregiver who rescued her, but still remained aloof with strangers. Clayton, the three-legged cat, was obsessed with playing fetch. She demanded it morning and night, when her mom was working, sleeping, talking on the phone, or having alone time with her husband. Of course, Gwen gave in to all her demands. "Cat lovers are fond of referring to themselves as their cats' ‘slaves’" or "adoring servants. "Dogs have owners, cats have staff" the saying goes." Unlike Scarlett, Clayton was more people-oriented than even the friendliest feline. She surprised the veterinarian when she jumped into her arms, purring away, after she had been given a needle. Fanny, another adopted cat, was Clayton's soulmate and was obsessed with food. Their mom was a full-time writer and called herself a "stay-at-home cat mom." Clayton and Fanny were smart. Clayton taught himself to play fetch, and Fanny figured out how to turn a doorknob to push open a slightly opened door. "The joy of spoiling our cats is that, in giving them simple pleasures, we get them right back. And they remind us that, no matter how complicated our lives are, or how complex our relationships, or how sophisticated our desires and goals may become with the passage of years, those simple pleasures are still the ones most worth having." Then there was Vashti, "The Picasso of Pee." The author named her Vashti from the Jewish story of Purim, that proud, beautiful queen who was exiled from ancient Persia for refusing to dance naked in front of the king. Like Vashti, this all-white feline was proud, beautiful, and independent. She didn't pee all over the house because she missed her litter box or had a bladder infection. She deposited her urine in order to make a statement. Vashti was an artist and capable of abstract thought. She was "a consummate creative spirit trapped in the body of a nine-pound cat. Her preferred creative method involved the application of yellow liquid to cloth and paint and solid surfaces—something a museum curator might refer to as non-traditonal mixed media." She was the "Monet of micturition, the Titian of tinkling and the Picasso of Pee." Vashti's magnum opus was to use her pee-sprees to say the things she couldn't say in words. She urinated on the author's boyfriend's couch several times because she wanted him out of the house. Other pees were an expression of love. Homer, the blind wonder cat, was an outgoing people feline who saved his mom's life by chasing off a 4:00 A.M. home invader. When he discovered the burglar's location at the foot of the bed by hearing his voice, he snarled and jumped at his face. The intruder fled for his life. Homer became famous in the author's national bestseller, Homer's Odyssey. This humorous chapter describes the trials and tribulations of putting a blind cat in front of a camera for photo shoots. First, she had had to convince the editors that a book on our feline friends needed to be written. Their response: "Cat Lovers Don't Read Books." Then she had to justify her writing profession to her mother who would ask: "So, what you're doing now for work . . . is you pretend to be a cat on the internet?" There was the time when Clayton, with only three legs, jumped on top of a dresser and got caught in a moth trap. Fanny thought that this was funny and began to follow Clayton with the sticky mouth trap stuck to her tail. It took some ingenuity on the part of Gwen and her husband, Laurence, to pull off the trap and settle her down. Another chapter describes how a routine trip to the vet turned into a misadventure, with Gwen running around the streets of Manhattan with three very cranky felines. But the most difficult time was when she pulled a muscle and had to lie on her back for several days. At first, the cats were happy to have their mom at home. They curled up in her bed, purring with contentment. But their happiness was short-lived when their mistress couldn’t get up to feed them. They meowed, purred, and brought stuffed toys to her but to no avail. Finally, Clayton deposited a live cockroach on her stomach. A hilarious encounter ensued. Every family mourns the death of their pets. "So it was after Vashti was gone. It was time itself, and not some ersatz 'replacement,' that eventually mended the breach . . . What I learned is that while clocks will never run backward, and things that are lost may never return, the heart is a resilient organ that knows how to take care of itself—if you get out of its way and allow it to do so." Gwen Cooper is known for the memoirs of her feline friends. Her works have been published in over two dozen languages. She donates ten percent of her royalties to abandoned, abused, and disabled animals. 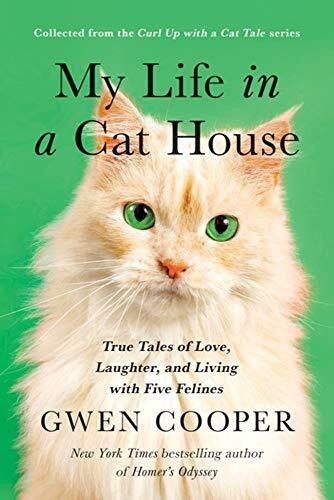 In My Life in a Cat House, Cooper lovingly and humorously depicts the ups and downs of a life with cats and the ways in which they mimic human behavior and feelings. A fun read for all animal lovers. Carol Katz is a staff reviewer at New York Journal of Books.